The all-new Subaru Ascent 3-Row family hauler gets tested by Consumer Reports. See what they say holds the Ascent back from being great. 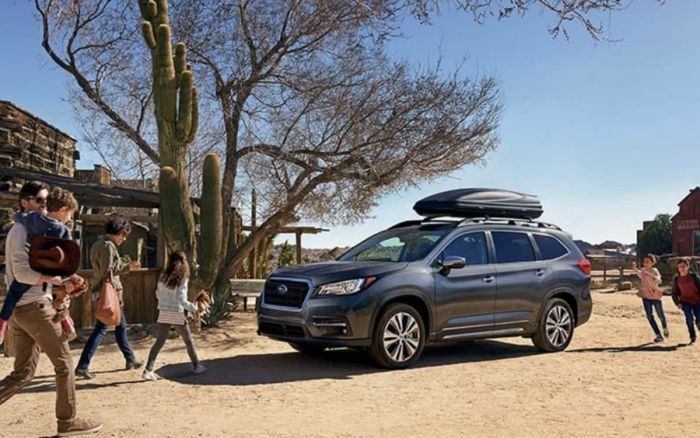 Torque News hasn’t had a chance to drive the new 2019 Subaru Ascent, but Consumer Reports rented a 2019 Subaru Ascent Premium and 2019 Subaru Ascent Touring for testing. What do they say about the largest vehicle Subaru has ever produced? They give it bad marks for its third-row space and less than impressive handling. Ascent enters a competitive market with established, popular models such as the Ford Explorer, Honda Pilot, and Toyota Highlander. It’s interesting they say further on in their report there isn’t really any 3-Row models that have superior third-row space for adults. CR says, “Third-row space is limited (common to the segment), but it can be useful for tweens and teens in a pinch. Most consumers will be using the new Ascent as their families grow and the third row will only be used for small kids. All the 3-Row models we’ve tested have limited space in the back. Unless you buy a big van, this is common to the segment and competition Ascent will face off with. The new Ascent is bigger than the Toyota Highlander and rides 8.7 inches off the ground, so it’s not going to handle like its smaller stablemates. CR did come away quite impressed with the ride comfort in both Premium and Touring models they tested. The all-new 2019 Subaru Ascent 3-Row family vehicle will hit showrooms this month. Consumers will be able to see for themselves. When I first saw the Ascent from a full side-on shot, I thought it was a Nissan Pathfinder. Not much in the way of unique styling at all. Yeah Jay - Unique Styling are just not words you'll find in the Subaru design language. I'm looking forward to test driving the Ascent. However, the expectation is that it will perform the needed tasks, like all they're other carlines. So, if your into aesthetics, Subaru may not be for you. As a Subaru owner, I've managed to keep my expectations tempered and focus on the utilitarian aspects of the brand. I LOVED my (12 year old) Tribeca from the moment I sat in it. We shipped it to our children and I expect it will last another 12 years. We've been waiting years for Subaru to offer a replacement for the Tribeca as I wanted some new safety features. Our Ascent was delivered in Aug. and I'm already thinking of looking for another car. The Ascent is a little too loose in handling but the real disappointment is with the electronics. I'm short so I needed something low to the ground and I do get that. To reach the engine button AND keep my foot on the brake to start the car I have to move the seat way up. At this point I can't reach the seat belt and can't reach the door to close it if it's open wide. If I close the door first, then belt up and then try to move forward using the Seat Memory setting I can sometimes beat the clock and accomplish this before there's a time out on the seat memory. Most of the time the seat doesn't move and I have to crack the door to reengage the memory to move the seat. I need to reverse this to get out and I can't always get the seat to move back until I crack the door. I don't like the idea of being belted in with the door unlocked. Another big disappointment is with the locking & unlocking door cycle. I'm not even going to attempt to explain the problems since there's no rhyme or reason to how - or when - or if - they work as expected. One tiny side trunk light is really insufficient if you park in a garage without windows and want to see what you are unloading from the trunk. Of course, you can open a passenger door to get the interior car lights to come on but that's really a pain when all you want is to go to the rear hatch. So I had to install some under the counter lights in the back so that I can see what to leave in the garage for the freezer and what bags need to go into my house. We got the version with leather seats but selected 2nd row bench seat for my dog. The wide opening rear doors are so nice! The 3rd row seats are folded down and will never be used. Wish the cargo area would lay flatter. Lots of cargo space for crates, chairs and everything else that needs to go to dog shows and performance events. Yes - this car was purchased for the dog! And she loves it. Now I just have to train her to move the driver's seat and unlock the doors. I'm going to solve all the electronic problems by using the key fob to open & lock the doors and will manually move the seats. I'll just pretend is a newer, slightly larger version of the Tribeca. Maybe someday Subaru will bring back the Tribeca. I can only hope. Help me out here. Consumer reports also has the Subaru Ascent listed as their top mid-sized SUV. In their highs/lows guide, they list the following for lows "agility" (as you've correctly pointed out. For Highs, they list "Ride, quietness, interior room, visibility, braking, controls, usable third-row seat, standard automatic emergency braking" So why the negative and biased title?